A pothole on Girard Avenue at 11th Street. 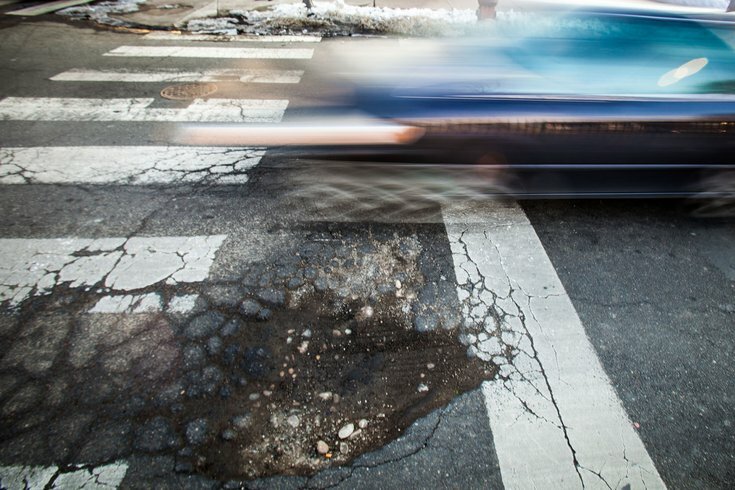 The Philadelphia Streets Department has missed its annual street paving goal by 83 miles for fiscal year 2016, contributing to the city's "pothole epidemic," City Controller Alan Butkovitz's office said Wednesday. The city has missed its goal of paving 131 miles each fiscal year for the last decade, according to Brian Dries from the controller's office. There was a slight increase in how many miles were paved from fiscal year 2015 to fiscal year 2016, with the figure jumping from 40 to 48 miles. Dries said that the Streets Department has had the 131-mile goal for the last 20 years. The Streets Department made the most headway in fiscal year 2009, paving 119 miles in Philadelphia. Since then, the city hasn't been able to get to the halfway mark. So what's to blame? Budget cuts, according to the controller's office. The budget for the Streets Department's Highway Division fell to $18 million in fiscal year 2013; it had once been $25 million. Mike Dunn, a spokesperson for the mayor's office, said cuts that affected departments across the city during the recession "curtailed" how many miles the Streets Department was able to pave. Dunn said that it takes about $200,000 per mile to pave the streets and that pothole costs about $22 per hole to repair. The Streets Department would need around $30 million annually to pave the 131-mile goal and to install $6 million in ramps around the city. Despite the challenges, the city has stepped up how many potholes it's been filling. In fiscal year 2012, the Streets Department got around to repairing 14,451 potholes to 35,541 during this past fiscal year, which ended in June. That also means that Philadelphians have been complaining more about potholes, which are made worse during harsh winter months. Butkovitz did praise the department on its response rate – about 80 percent of potholes that they did repair were done in one to three days, a standard they've set. Dunn said that the Streets Department's paving budget has increased and that the city is on track to reach the 131-mile goal in the next four years. He welcomed any recommendation that Butkovitz might have. "But obviously, this is a big challenge in a city with an aging infrastructure," Dunn said in an email. "Citizens should report all street defects to 311. We are working hard to ensure that we provide good customer service and to improve that system accordingly."